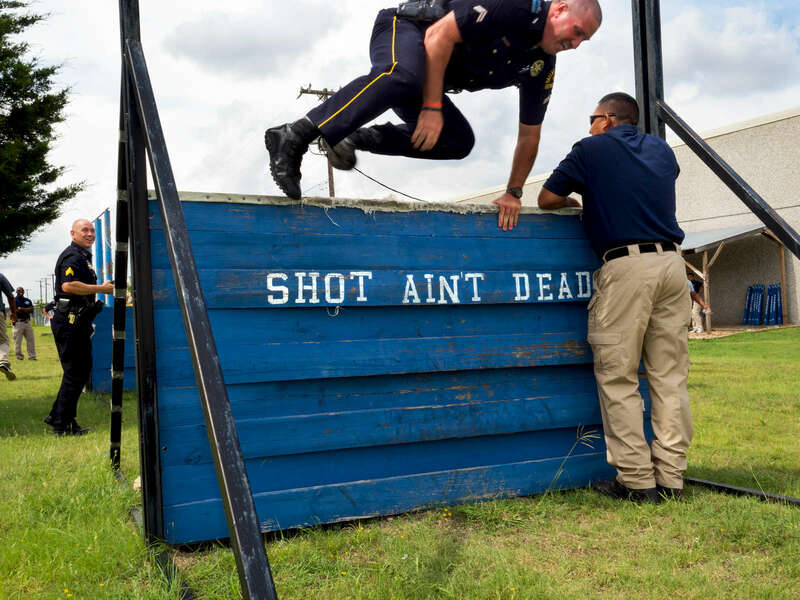 A Dallas Police Officer shows how to navigate the obsticle course to participants attending the basic class at the Dallas Junior Police Academy. Dallas is a major city in Texas and is the largest urban center of the fourth most populous metropolitan area in the United States. The city ranks ninth in the U.S. and third in Texas after Houston and San Antonio. The city's prominence arose from its historical importance as a center for the oil and cotton industries, and its position along numerous railroad lines. For two weeks in the summer of 2015, photographer Peter Dench visited Dallas to document the metroplex in his epic reportage, DENCH DOES DALLAS.